H.E. Ana Brnabić has been the Prime Minister of Serbia since June of this year, succeeding Aleksander Vučić after his inauguration as President of Serbia. Born in Belgrade in 1975, she obtained an MBA in marketing from Hull University, UK, and has more than ten years of experience working with international organisations, foreign investors, local governmental organizations and with the Serbian public sector. In August 2016 she was nominated Minister of Public Administration and Local Self-Government and held the positon until her election as Prime Minister. She is President of the Serbian Government’s Council for Innovative Entrepreneurship and Information Technologies, as well as of the Serbian Council for National Minorities and is Vice President of the Serbian Council for Public Administration Reform. As Minister of Public Administration and Local Self-Government, she worked on a faster introduction of e-administration in Serbia in order to secure a more efficient work of the public administration, on a direct improvement of the quality of life of citizens of Serbia, on building a more modern and transparent administration and on the fight against corruption. In the fight against the gray economy, she was in charge of the implementation of the “Take the Receipt and Win” prize game in which more than 40% of citizens of Serbia participated and which significantly raised the awareness of the issue. She is a member of the group “New Leaders for Europe” as part of the World Economic Forum. 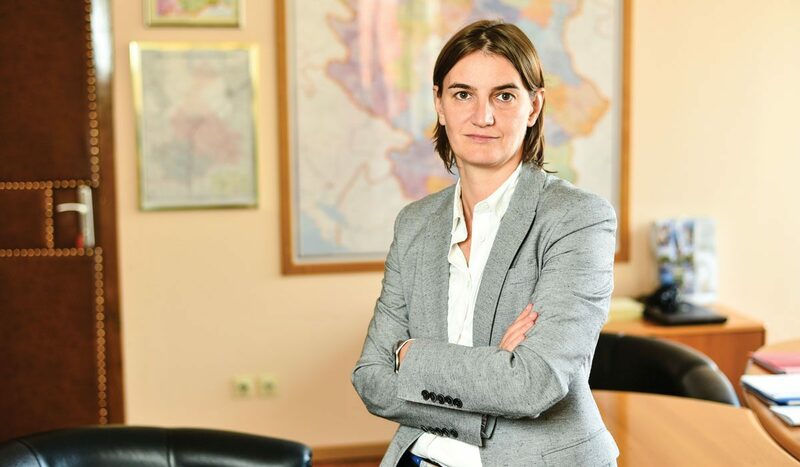 Prior to her election in the Serbian government, Brnabić was Director of Continental Wind Serbia (CWS), where she worked on the execution of an investment worth €300 million in a wind farm in the municipality of Kovin. During her business career, Brnabić also worked with consultancies on programmes financed by the US Agency for International Development (USAID) in Serbia. In 2006 she helped establish the National Alliance for Local Economic Development (NALED). Brnabić has received numerous awards for development projects she worked on and for the promotion of socially responsible business and tolerance.